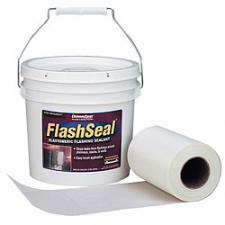 FlashSeal by SaverSystems seals those pesky leaks around flashings and it's so much easier to work with than tar. Simply prepare the area to be sealed. Next, apply a base coat of FlashSeal compound a few inches up the chimney and on the surrounding roof that is wide enough for the reinforcement fabric (sold separately) to cover it. Then place the reinforcement fabric over the base coat. Apply the topcoat and the job is done! FlashSeal can be applied with a brush. One gallon container covers 28 linear feet.